With Revel's robust inventory management, you can add your vendors to your system and attach products or ingredients to specific vendors, streamlining record keeping and expediting purchase order creation. In the Management Console, navigate to the Inventory tab. Fill out Vendor Name along with any other relevant fields. These fields serve as record-keeping tools and also auto-populate when you create purchase orders for the vendor. Repeat this process for all vendors that you want to add individually. Navigate to the Inventory tab and click the Vendors tab. 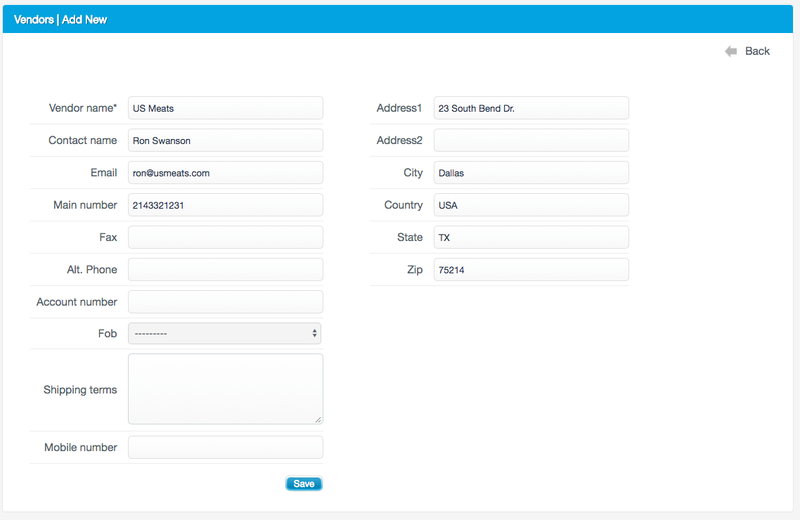 Then, click Vendors Info Import/ Export. In the exported file you'll see the vendor information fields in the spreadsheet columns. Fill out the template with your vendor information. When you're done, save the file to your computer. Navigate back to the Vendors tab and click Vendor Info Import / Export. Click Choose File and attach your saved spreadsheet. Once your file is attached, click Import. You can confirm that your updates were successfully uploaded by checking the import results email. If you would like the results emailed to a different email than is listed, please input the email in the empty box above the import button. After you have confirmed that all of your new information was successfully uploaded, click +Attach Vendors at the bottom of the Vendors tab. Start in the Product Inventory tab or Ingredient Inventory tab, depending on what items you want to attach to your vendors. In the new window, start typing the vendor name. Choose the correct vendor from the options that appear. If your vendor requires that you order the item with a reference ID, enter it in the Vendor Item ID field. If this is not applicable, leave this field empty. Next, select the unit of measurement that you'll be using to order this item. If you want your purchase order to automatically enter a reorder quantity for the item, fill out the Default Quantity. Similarly, if you want your purchase order to automatically enter a cost for the item, fill out the Default Price. The default cost should be entered as the cost per single unit. In the Inventory tab, click the Vendors tab. Click Export or Default Template. Export will provide you with a template that contains your previously attached products or ingredients, while Default Template will give you an empty spreadsheet. Open your downloaded spreadsheet. Fill out the Vendor ID, which you can find next to the vendor name on the Vendors tab. Then, fill out the Vendor Name, Item Type (either ingredient or product), the Item Name (ingredient or product name), the Barcode or SKU (at least one of these is required per item when importing), the Stock Unit, and, if applicable, Vendor Item ID, Default Quantity, and Default Price. 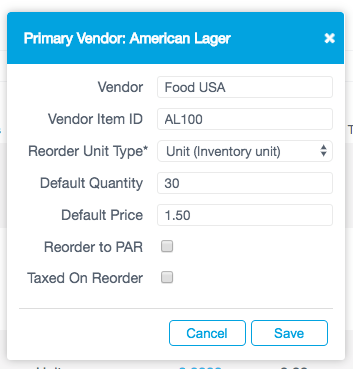 Reorder to PAR, Taxed on Reorder, Primary Vendor, and Active should all be filled out with Yes or No, depending on your preferences. Now that you've completed your spreadsheet, save your file. Back in your Management Console, click Vendor Items Import / Export. Click Choose File and attach your saved file. Once attached, click Import. Confirm all changes successfully uploaded by checking the import results email. If you would like the results emailed to a different email than is listed, please input the email in the empty box above the import button.